Princess Elsa has given Rapunzel a gift, she does not know very well what she has bought but she has taken advantage of the fact that she was on sale. It is a time machine that will transport them to the future and now they have to change their wardrobe to go unnoticed in this world. You will have to start with Rapunzel and we will prepare a nice makeup and then go to the dressing room. We will have clothes and makeup of the future from which to choose which of them we will apply to each princess. When you finish with Rapunzel it will be Elsa' s turn and we will have to follow the same steps as with the previous one. At the end we will have a minigame that if we complete we will be given new futuristic clothes to use in the following games. Join Rapunzel and Elsa, the princesses of the future on this trip. 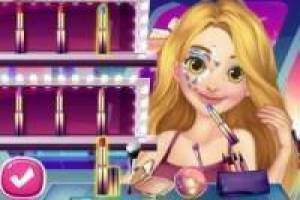 Enjoy the game Rapunzel and Elsa: Princesses in the future, it's free, it's one of our rapunzel games we've selected.